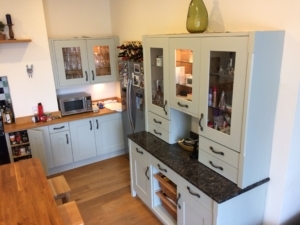 Kitchen Edit have added the door replacement service recently as we can see that sometimes clients want a change of style as well as colour. 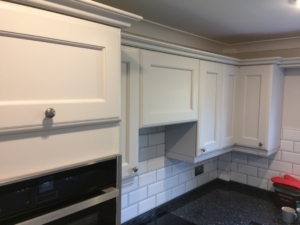 The problem we have found with clients using replacement companies is that when the companies find a none standard part to your kitchen (like a plate rack, wine rack or ornate cooker hood for example) they will expect you to paint it to match. To us that is not a complete kitchen makeover service. Our belief is that we can offer a more flexible kitchen door replacement service as we can both replace doors AND spray everything else to match. We also do not need fancy showrooms and can therefore pass our overhead savings on to you. We can bring any samples straight to you if you need to see them. What we have noticed from feedback from customers is that some door replacement companies will tell you that your existing door cannot be sprayed; this is wrong. You can spray any surface with the right preparation and primers. 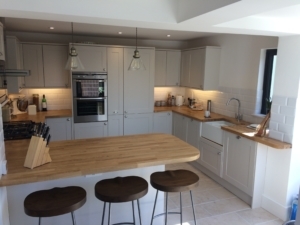 In addition to replacement doors we can offer all the other kitchen makeover products you would expect: tiling, worktops, lighting and other resurfacing techniques. These techniques include resin and microcement products as well as different paint products. These can be applied to existing tiles. Got your heart set on some solid granite worktops? We can arrange this too. If you are thinking of replacing your kitchen doors, please make sure you give Kitchen Edit a ring so that you can see how we compare. We cover the areas between Penzance and Bristol, so if you live in Cornwall, Devon, Somerset or Avon do not hesitate to get in touch.